Tutorial – Fading a RGB LED on BeagleBone Black « Adafruit Industries – Makers, hackers, artists, designers and engineers! 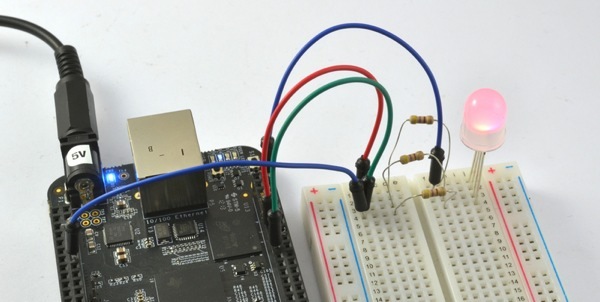 Tutorial – Fading a RGB LED on BeagleBone Black. In this tutorial, you will learn how to control the color of an RGB LED using a BeagleBone Black (BBB). Because the BBB runs Linux, there are many ways in which it can be programmed. In this tutorial we show how to control the power output of a GPIO pin and hence control the color of an RGB LED using Python. The tutorial uses a technique called PWM (Pulse WIdth Modulation) to vary the brightness of each color channel between 0 and 100.